How Can I Support WellOne? There are many ways that patients and community members can support WellOne, from the traditional contributions of time, money, and talent to simple actions such as your choice of pharmacy or Internet search engine, referring friends and family members to WellOne, or contributing to our continual improvement by completing a patient satisfaction survey. WellOne gratefully accepts contributions, memorials, bequests and designations directly or through the United Way (#6290). Donations are tax-deductible and are accepted for any of our programs or in memory of a loved one. WellOne is licensed as a public charity by the Rhode Island Department of Business Regulation. 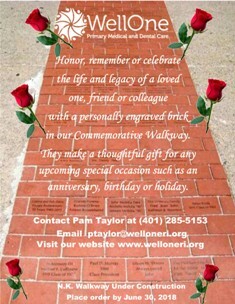 Brick Walkway Purchase a brick that you can personalize to remember a loved one, honor someone or commemorate a special occasion, such as an anniversary, birthday or holiday. Cost per brick is $100.00. Your brick allows for an inscription on three lines with 18 characters PER line including spaces and punctuation. Order soon to insure your brick is installed before winter weather sets in. Naming Opportunities Would you like to have an exam room, waiting room or building named in memory of a loved one? We have naming opportunities in North Kingstown, Foster, Pascoag and North Scituate. Patient prescriptions filled at our partnering CVS pharmacies generate funding to support care for uninsured and underinsured patients. Of course, you may use the pharmacy of your choice but using one of these CVS stores helps WellOne to continue to provide care at discounted rates to those in need. There are now nine participating CVS pharmacies throughout Rhode Island and one in Eastern Connecticut at which you can have your prescription filled. See a WellOne staff member for more information. You can raise money to support WellOne every time you search or shop online! WellOne will receive a penny every time you search the web just by using Goodsearch, a web browser that will support care for your neighbors, friends, and family. Download Goodsearch’s free toolbar and money from Yahoo advertisers will go to WellOne without you spending a dime or leaving your chair! The toolbar has a search box and each time you search the Internet, about a penny is donated to WellOne. Once added to Internet Explorer or Firefox, each time you shop at more than 1,300 stores (from Amazon to Zazzle!) a percentage of your purchase will automatically be donated to Wellone – at no cost to you (and you may even save money as the toolbar provides coupons and deals as well!). Set this on your computer as your home page and use this as your search engine. Pass it on to others to help to support WellOne. The two minutes it takes to add this toolbar to your browser can make a lifetime of difference for our patients! WellOne wants to hear from you. 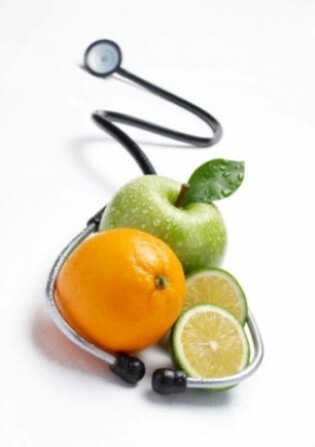 We provide patients the opportunity to provide us with feedback after every visit. Please take a few minutes to tell us how we are doing. Your thoughts count!